Not that I think romance needs a schedule but Valentine’s Day is an excellent excuse to make that additional effort – I mean effort in a positive way – to feel good about ourselves and also with our loved ones. Energy and good mood are the core to my definition of wellbeing. If you’re like me, by this time of Winter you’re in need of a little boost. That’s why today I’ll be writing about two superfoods that hit bang on this need: raw cacao and maca. I’m not one to say that healthy eating is about superfoods, not at all. However, as we don’t live under a rock, we find ourselves constantly hit with sales copy and suggestions and ideas… Curiosity arises. That’s why I decided to bring up the ones I find useful, to help you make an informed decision. We all know cacao: core ingredient of treat food extraordinaire, Mr. Chocolate! In it’s purer form, cacao has a rich nutritional content, with high antioxidant power among other mood and health enhancing benefits. And that’s why Dr. Weil, world-renowned specialist on the subject of anti-inflammatory diet, has included dark chocolate (minimum 70% cacao/cocoa solids) in his food pyramid. Now, that’s a food pyramid we love! Dark chocolate such as Dr. Weil loves to eat is not to be mixed up with chocolate bars you see by the grocery store’s cashier… No, he means a high quality chocolate, that has fewer ingredients and a higher cacao percentage. Read more about Dr. Weil’s view on dark chocolate in THIS post. Luckily for us, this type of chocolate is now quite easy to find. As is raw cacao powder, which is amazing when used in healthy homemade desserts and snacks, that are delicious and have none of the nasty little chemicals so frequent in processed foods. I buy raw cacao powder to make my healthy chocolate recipes, and also as “cacao nibs”, that can be used more as decoration, or to add texture to a cookie, a bar or a smoothie bowl. Cacao has a number of relevant nutrients and minerals, such as magnesium, sulfur, calcium, iron, zinc, copper, potassium and manganese. Eating magnesium-rich foods is said to help balance brain chemistry (namely having an anti-depressive effect), to help with bone density, and to regulate blood pressure as well as heart rate. Sulfur, on the other side, is know as the beauty mineral, due to its positive impact on skin, hair and nail’s condition. Cacao also boosts serotonin levels in the brain, one of the so called “happiness hormones” – another helping hand we need so badly during Winter time! Maca is a root vegetable, originated in Peru and grown on the Andes mountains. It is a cruciferous vegetable, related to cabbage, broccoli and kale. In Europe, we get only the powder version, that is made from dried maca root. It gets to be called the “nature’s viagra” … Even though there are not many conclusive studies to confirm it, maca is said to have a regulating effect on both human and animal fertility. Maca contains protein and fiber. Added to that, a number of vitamins and minerals that are quite relevant to the human body: vitamins C and B6, calcium, iron, copper, potassium and manganese. It is a starchier vegetable when compared to its cruciferous “cousins”. However, this higher carb composition and corresponding higher calorie count shouldn’t be a problem when we’re talking about having a tablespoon every now and then. Anyway, for me, maca is interesting not only for its stimulating and antioxidant effects but also as an ingredient: its flavor is sweet and similar to caramel, and it complements well all chocolate/cacao based desserts and even smoothies. So, now I’ll bid my goodbyes with a new recipe, perfect for sharing with someone very special on this upcoming Valentine’s Day. It’s a raw, vegan and extremely easy recipe. But it’s also a great romance and good mood booster! Pit the dates and separate them in halves. Place all the dates in the food processor and pulse a couple of times. Add the remaining ingredients – except the strawberries – and process until you get a pasty consistency. You’ll still see the hazelnut pieces and a few cacao nibs, it’s ok! Transfer the dough onto a plate and separate into 20 pieces. Use the palms of your hands to roll the dough into the ball shape. Alternatively, use an ice cream scoop to measure each ball. Smash the strawberries with the help of a spoon, a rolling pin or even a small food processor. 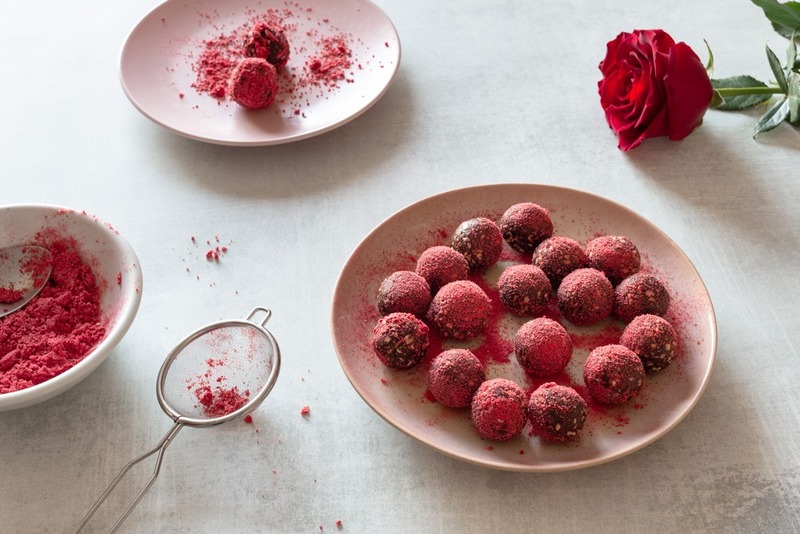 Place the resulting powder on a plate and roll the energy balls on it, so that the strawberry powder sticks to the balls and they get cute little pink specs. The energy balls will keep for several days in a closed container in the fridge. They are wonderful as a snack or dessert. Pre-heat the oven to 180º C (360º F). Place the hazelnuts on a metal tray and in the oven. Set your timer for 5 minutes. When it rings, shake the tray and set the timer for 5 minutes, again. Do it all over again, until you feel the toasted hazelnut aroma in your kitchen, it should take 15 to 20 minutes in total. Take the tray out of the oven and transfer the hazelnuts to a dry kitchen towel. Fold the towel on the hazelnuts and rub carefully, to remove the skins. Separate the nuts from the skins and reserve (or use right away on this recipe).